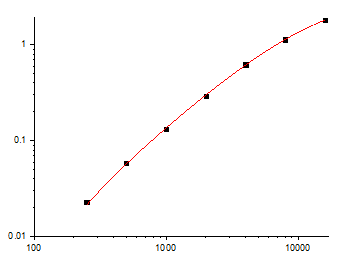 Amino acid sequence derived from mature form of human IL6 (NP_000591.1) (Val 30-Met 212) was expressed, with an initial Met at the N-terminus. 1. Measured by its binding ability in a functional ELISA. 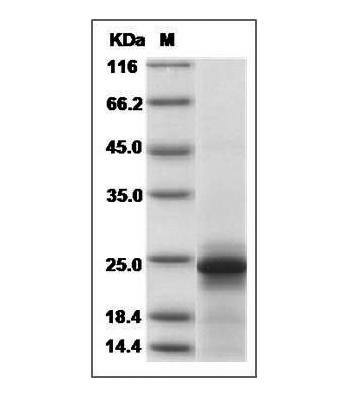 Immobilized recombinant human IL-6 at 8 μg/ml (100 μl/well) can bind recombinant human IL6R with a linear range of 1.25-20.0 ng/mL. 2. 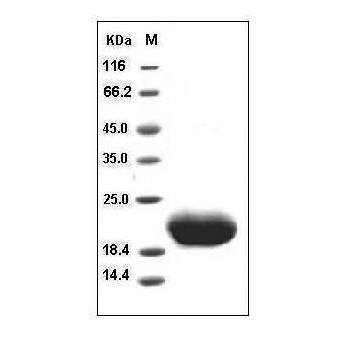 Measured in a cell proliferation assay using TF-1 human erythroleukemic cells. 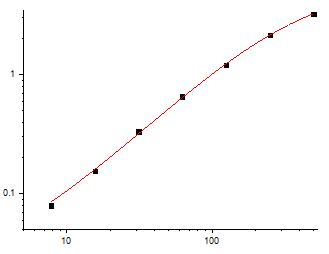 The ED50 for this effect is 0.75-3 ng/mL. 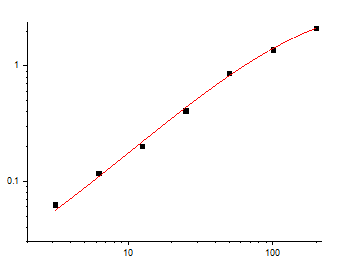 The specific activity of Recombinant Human IL-6 is approximately 0.35 × 105 IU/μg. The recombinant human IL6 consists of 184 amino acids and migrates with an apparent molecular mass of 20.3 kDa as estimated in SDS-PAGE under reducing conditions. Fig.SDS-PAGE analysis of Human IL-6 protein. Always centrifuge tubes before opening. It is recommended to reconstitute the lyophilized Human IL6 protein in sterile ddH2O not less than 100µg/ml, which can then be further diluted to other aqueous solutions. Lyophilized Human IL6 protein product should be stored desiccated below -20°C. Upon reconstitution, the protein should be stored at 4°C between 2-7 days and for future use below -20°C. For long term storage it is recommended to add a carrier protein (0.1% HSA or BSA). Please prevent freeze-thaw cycles. Interleukin-6 (IL-6) is a multifunctional α-helical cytokine that regulates cell growth and differentiation of various tissues, which is known particularly for its role in the immune response and acute phase reactions. IL-6 protein is secreted by a variety of cell types including T cells and macrophages as phosphorylated and variably glycosylated molecule. It exerts actions through the its heterodimeric receptor composed of IL-6R that lacks the tyrosine/kinase domain and binds IL-6 with low affinity, and ubiquitously expressed glycoprotein 130 (gp130) that binds the IL-6. IL-6R complex with high affinity and thus transduces signals. IL-6 is also involved in hematopoiesis, bone metabolism, and cancer progression, and has been defined an essential role in directing transition from innate to acquired immunity.